Today, 8 February, marks the 50th anniversary of the election of Gough Whitlam as leader of the Australian Labor Party. On this day in 1967, he replaced Arthur Calwell, who had been party leader since 1960. The ALP had been in opposition since December 1949. The shift from Calwell to Whitlam was huge, overturning nearly 70 years of ALP principles such as the White Australia Policy and protectionism. It was the end of a socially conservative old guard: a modernising move on the part of young professionals like Whitlam, Don Dunstan, Jim Cairns and Moss Cass. Whitlam had been ALP deputy leader since 1960 but Calwell did not support him and had wanted instead Eddie Ward, an old Labor man more of his own outlook and class background. Under Calwell, Labor narrowly lost the 1961 election, lost again in 1963 and was soundly defeated in 1966. Calwell, a rough diamond with a high-pitched rough voice, had developed skills of oratory on the stump whereas his younger opponent, Prime Minister Harold Holt, was polished and well-spoken. Calwell was born in 1896 and represented an Irish–Australian nationalist tradition, Catholic social conservatism and a commitment to socialism (by which he meant nationalisation). He was active in the anti-conscription struggles of the First World War and also during the economic Depression of the 1930s. In the late 1920s, he led the Australian Public Sector Association in Victoria. Calwell never went to university but was an avid reader, of strong intellect, and someone who learned plenty from the ‘university of life’. He became President of the Victorian state branch of the ALP in 1931 and was elected to the House of Representatives for the seat of Melbourne in 1940. His leadership abilities and talent led Prime Minister John Curtin to appoint him as Minister for Information during the Second World War and then, after the war, Prime Minister Chifley made him Minister for Immigration. Calwell oversaw the greatest immigration program in Australia’s history. But he was wedded to the White Australia Policy, which had been bipartisan parliamentary policy since 1901 (save for a couple of Free Traders). He oversaw the deportation of hundreds of Chinese and Malay seamen who had taken refuge in Australia during the war. The two rivals – Calwell and Whitlam – were as distinct from one another as could be imagined within a political party. Whitlam was 20 years younger than Calwell – a different generation. Urbane and cosmopolitan, he came from an upper middle-class family. He attended a state school and Canberra Grammar before going to the University of Sydney to study Law. Calwell had attended Catholic schools in working class inner Melbourne. Whitlam had an Anglican upbringing but was an agnostic. Whitlam joined the ALP in 1945 after service with the Royal Australian Air Force. Unlike Calwell, he was not a trade unionist and became a barrister. Whitlam was elected the Member for Werriwa, in Sydney’s west, in 1952 after the death of sitting member Bert Lazzarini, who was born in 1884 and part of the old guard. Gough Whitlam was more social democrat than socialist and once said that nationalisation was ‘the Old Testament’ whereas he preferred ‘the New Testament’. In the 1960s, more and more households were acquiring television and the new media became very important at election time. Calwell’s physical appearance and his gruff way of speaking were no match for Menzies or Holt. The latter came across as statesmen whereas Calwell came across as fairly ordinary. Cartoonists unkindly portrayed him as a cockatoo. It was no secret that Whitlam wanted to lead the ALP and that Calwell was the obstacle. Things came to a head in 1965 when the Australian quoted Whitlam’s supposedly off-the-record remarks that Calwell was ‘too old and weak’ and too ‘old-fashioned’ to win an election. 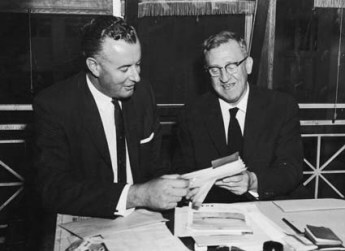 At the ALP’s biennial conference in 1965, against Calwell’s wishes, Whitlam secured support for the removal of the White Australia Policy from the party’s platform. This was symbolic not just of a desire for a new approach to immigration but also recognition of Australia’s new role and place in the world. Whitlam’s persona, his intellect and great wit, his careful eloquence, skills of oratory, and his physical stature, made him ideally suited for television. Whitlam is regarded today as having been on the left politically but he was actually in the party’s Right faction when he replaced Calwell. Whitlam was strongly opposed to the Left and to the influence of the trade union leaders in formulating party policy. At the time of Whitlam’s ascendancy, the principal political issue in Australia was the Vietnam war. Arthur Calwell had gone to the 1966 election on a policy of complete and unconditional withdrawal of Australian troops from Vietnam. Public opinion was not then with him and Labor was badly defeated. Calwell stated that ‘it is better to be defeated on principle than to win on lies’. He resigned in January 1967 and Whitlam was elected ALP leader on 8 February. Whitlam rejected Calwell’s policy on Vietnam and instead advocated ‘holding operations’ there. This change of policy spurred the growth and militancy of the movement against the war, as its opponents could no longer attain their objective by voting Labor. Whitlam remains the longest-serving ALP leader. He held the position for nearly eleven years, until December 1977. Arthur Calwell died in 1973. Gough Whitlam died in 2014.